Learning strategy is a chosen set of policies, which have been linked to factors that determine the strategy, including: selection of subject matter (teacher or student), resenters of subject matter (individuals or groups, or independent learning), how to present subject matter (inductive or deductive, analytical or synthesis, formal or informal), target recipients of subject matter (groups, individual, heterogeneous, or homogeneous). Learning Approach is the path or direction taken by the teacher or student in achieving the learning objectives seen how the material is presented. For example, understanding a principle with an inductive or deductive approach. Learning Method is a way of teaching in general that can be applied to all subjects, for example teaching with expository, question and answer, guided discovery etc. Teaching technique is the specific application of a learning method that has been adapted to the abilities and habits of the teacher, the availability of learning media and the readiness of students. For example the technique of teaching multiplication with repeated summation. While the Learning Model is a design that describes the process of detail and the creation of environmental situations that allow students to interact so that changes and developments occur within themselves. 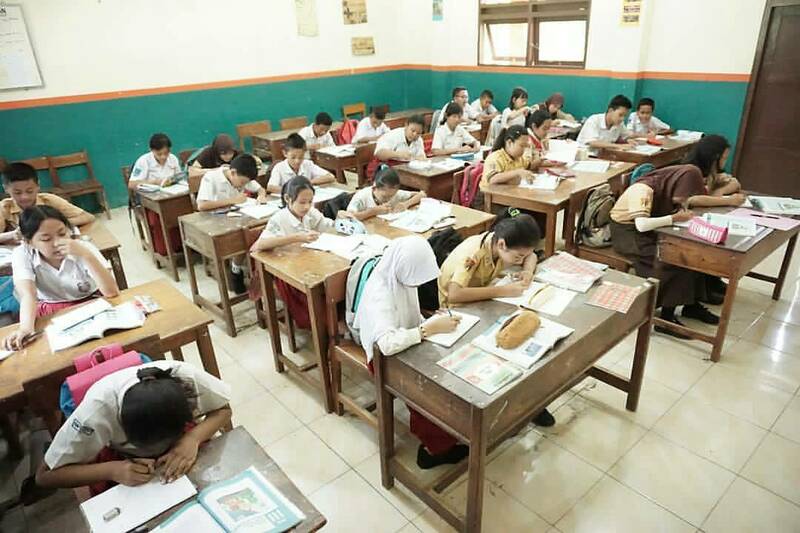 Soedjadi said, the learning strategy is a strategy to carry out learning activities that aim to change the condition of learning into expected learning. To be able to change the situation can be achieved by various learning approaches. In one approach can be done more than one method and in one method can be used more than one technique. can be sorted as follows: Technique --> method --> approach --> strategy --> model. The term "learning model" is different from learning strategiy, learning method, and learning approach. Learning Model includes a broad and compelling learning model. The concept of learning model was born and developed from a psychology expert with an approach in the experimental setting. The concept of the learning model was first developed by Bruce and colleagues (Joyce, Weil and Showers, 1992). Different meanings between model, strategy, approach, method and technique are expected to teachers in general to be able to choose a model and have learning strategies that in accordance with the material and competency standards. In learning, the teacher is expected to be able to choose a learning model that in accordance with the subject matter being taught. Where in the selection of learning models include the approach of a broad and comprehensive learning model. For example, in a problem based learning model, small groups of students work together to solve a problem agreed upon by students and teachers. When the teacher is applying the learning model, students often use a variety of skills, problem solving procedures and critical thinking. Problem based learning model is based on constructivist learning theory. In this model, learning begins with presenting real problems where the solutions require collaboration among students. In this learning model, the teacher guides students to describe problem solving plans into stages of activity; the teacher gives an example of the use of skills and strategies needed so that the tasks can be completed. The teacher creates a flexible class atmosphere it and oriented to the effort of students inquiry. Learning models can be classified based on learning objectives, syntax (sequence patterns) and the nature of the learning environment. An example of goal-based classification is direct learning, a good learning model to help students learn basic skills such as multiplication tables or for many topics related to the use of tools. But this is not appropriate when used to teach high-level mathematical concepts. Syntax (sequence pattern) of a learning model is a pattern that describes the sequence of the flow of the whole stages which is generally accompanied by a series of learning activities. Syntax (sequence pattern) of a particular learning model shows what activities must be done by the teacher or student. The syntax (sequence pattern) of various learning models has the same components. For example, each learning model begins with efforts to attract students' attention and motivate students to be involved in the learning process. Each learning model ends with the closing stage of the lesson, which includes activities to summarize the main points of the lesson carried out by students with the guidance of the teacher. Each learning model requires a management system and a slightly different learning environment. For example, cooperative learning models require a flexible learning environment such as available tables and chairs that are easily moved. In the discussion learning model the students sit in a circle arranged. While the learning model directly students sit face to face with the teacher. In the cooperative learning model students need to communicate with each other, while in the direct learning model students must be calm and pay attention to the teacher. The selection of models and learning methods relates to learning strategies. Learning strategies are appropriate and careful planning and actions regarding learning activities so that basic competencies and learning indicators can be achieved. Learning is an effort to create a climate and service to the abilities, potentials, interests, talents, and needs of diverse students so that optimal interaction between teachers and students occurs and between students and students. In school, this learning action is carried out by resource persons (teachers) to their students (students). So, in principle, the learning strategy is closely related to the selection of models and methods of learning that teachers do in delivering teaching materials to their students. Many elementary students are still in the stage of concrete thinking. Whatever models and methods are applied, the use of teaching aids is still needed in explaining some mathematical concepts. We don't need to be fanatical about one of the existing learning models. Each learning model must have weaknesses and strengths. We can choose one of the learning models that we think is appropriate with our learning material; and if necessary we can combine several learning models. Whatever model we apply, if we do not master the subject matter and are not liked by the students, then the learning outcomes become ineffective. We need to master the material we must teach, be able to teach it, and be skilled in using teaching aids. We intend to give what we have to students with all our heart, warm, friendly, enthusiastic and responsible. Keeping students "loving" us, enjoying the material we teach, while maintaining our credibility and authority as teachers can develop their own learning models. Suppose we are carrying out Classroom Action Research. The learning model that can be applied by teachers is very diverse. Learning model is a pattern or certain learning steps that are applied so that the objectives or competencies of learning outcomes are expected to be quickly achieved more effectively and efficiently.